Ms. Marvel had one hell of an emotional issue last month. We got to see the culmination of a long history of a supporting character in Zoe and it was so satisfying and beautifully written. I’ve told many people that this book is one of the best books being written right now and last month proved it yet again. 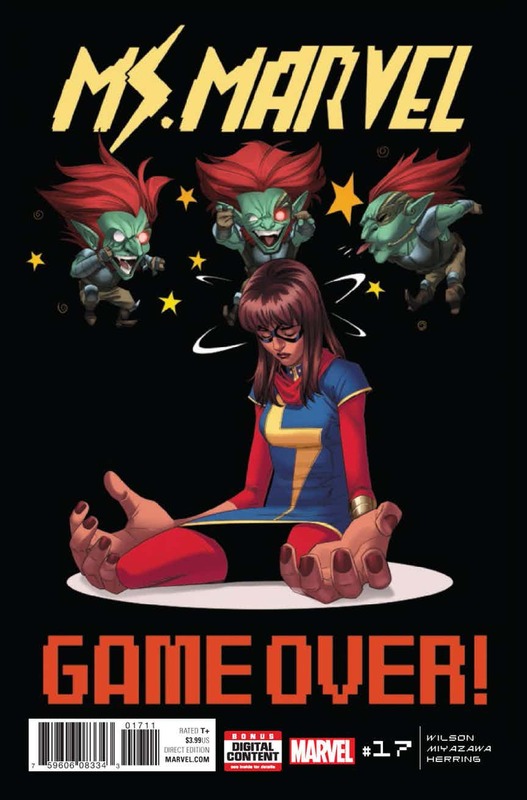 This whole story arc has been fairly interesting and had some really heavy implications as for the future of Ms. Marvel. Hell, the enemy knows Ms. Marvel’s secret identity and could release it any moment. Not to mention he has the ability to hack peoples brains. (Which is ridiculous but serves the purpose of heightening stakes in this book). Anyway, I can’t wait for this new issue to finish off this new story arc so let’s just dive right into it. Our issue begins with Zoe who is walking through school for the first time since her drafts have been leaked. Most people in the school notice her immediately and even some in the hallways are reading her messages aloud, mocking her. 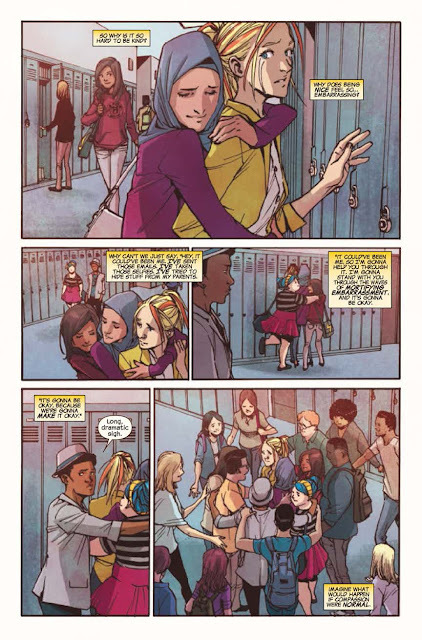 Zoe stands in front of her locker and begins to cry when Nakia comes from behind her and embraces her. Kamala sees this and does the same. Soon they are joined by Mike and before you know it, a large group of students have joined in and are supporting Zoe. After seeing such a display of love and support, Kamala is sure of her new plan to take down Doc.X. We arrive at the Circle Q where three young men have shown up. It turns out that these three men are the members of Kamala’s video game guild. After meeting each other, they turn around to see Ms. Marvel standing there who reveals that she is the last member of their guild. They are obviously surprised by such a revelation but she tells them that she needs their help to stop Doc.X. Doc.X learns from monitoring their behavior and so they go into the game world and instead of playing and spreading negativity, they freely give rewards to other players and spread the love. After playing for a while, Ms. Marvel decides to go out and face Doc.X. Doc.X starts to threaten Mike when he suddenly changes his tune and wishes her the best. It would seem that the plan is working. 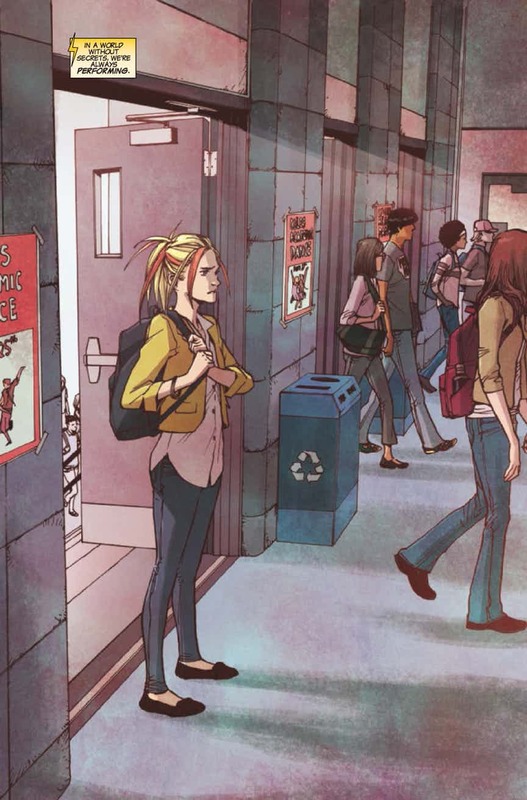 However, Kamala soon finds herself in the one place she wanted to avoid—a crowd of people. Doc.X begins to take over several members of the crowd and attacks Kamala. Doc.X lands a few hits but soon finds himself unable to commit evil deeds anymore. In his frustration he hacks a huge screen and materializes himself. Of course, this gives Kamala a chance to face him head on. It only takes one punch for Doc.X to be defeated and Kamala walks off victorious. However, at the end we see a phone on the ground which seems to be where Doc.X fled. We see the words “The End?” in the final panel, leading us to believe that Doc.X is still around and dangerous. This is where the issue leaves us. Honestly, this issue is kind of a letdown. I’ve loved this story arc so far and it was so interesting. Not to mention we had the whole Zoe storyline which continued in this issue. Seeing that beginning of the issue was amazing and definitely hit me in the feels. That being said, the way that Doc.X was defeated was a bit disappointing and didn’t make a whole lot of sense to me. It makes more sense that he is still around just waiting to attack once again but other than that, the ending was a bit of a dud. Granted, I still really enjoyed this issue and the art is wonderful as usual. This final issue of the latest Ms. Marvel story arc is a bit disappointing. Our big threat seems to be defeated rather easily and in a very strange way. However, we got amazing art and the scene at the beginning with Zoe and the school will tug on any reader’s heartstrings. This is still an amazing book and one well worth buying. This one issue just kind of falls flat.